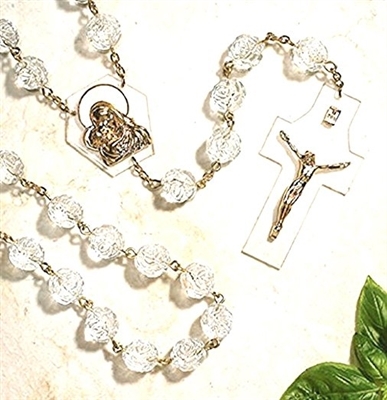 The acrylic rosebud wall rosary is a devotional and decorative way to proclaim one's faith. The large crucifix measures 4" high and the total length of the rosary is 45" long. This rosary make a great Home Blessing, Christmas gifts for any family. Crucifix, Veronese, Hand-Painted Mary and Trinity Crucifix 10 inches Apostle Crucifix 12" Saint Benedict Cross - Ceramic Crucifix 8.5" x 6"